Providing you the best range of suction machine, portable suction machine, vacuum suction machine, compressor operated suction machine and surgical suction machine with effective & timely delivery. Vacuum Gauge 2 Inch, BCPM. 0- 760mm Hg calibration. 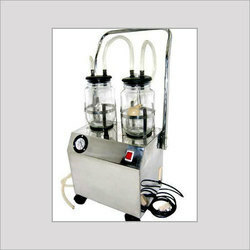 Our assortment of Suction Machine is capable of giving powerful suction with the remarkably noiseless operation. Our Suction Machine is very economical due to energy efficient compressor and therefore largely demanded by a wide base of clientele. It is easy to handle and offers easy mobility. Our assortment of Portable Suction Machine is capable of giving powerful suction with the remarkably noiseless operation. Our machine is very economical due to energy efficient compressor and therefore largely demanded by a wide base of clientele. It is easy to handle and offers easy mobility. Vacuum Capacity 760 mm/ Hg. We offer a gamut of Vacuum Suction Machine is capable of giving powerful suction with the remarkably noiseless operation. Our Vacuum Suction Machine is very economical due to energy efficient compressor and therefore largely demanded by a wide base of clientele. It is easy to handle and offers easy mobility. Gives instant vacuum with the regulator to control vacuum as per Doctors requirement. Especially design self-sealing rubber caps. Our assortment of the Compressor Operated Suction Machine is capable of giving powerful suction with the remarkably noiseless operation. Our Compressor Operated Suction Machine is very economical due to energy efficient compressor and therefore largely demanded by a wide base of clientele. Pump Type: Exceptionally Noiseless Operation due to oil immersed Piston pump. 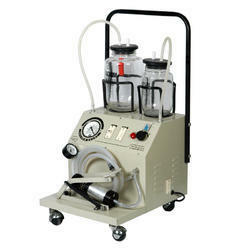 Our array of Surgical Suction Machine is capable of giving powerful suction with the remarkably noiseless operation. Our Surgical Suction Machine is very economical due to energy efficient compressor and therefore largely demanded by a wide base of clientele. It is easy to handle and offers easy mobility. Pump Type: Rotary vane pump mounted on ¼ hp. Local made Motor and provided with oil tank for oil-immersed performance.